A local advocate for veterans says that Comcast is a national leader in efforts to not only employ, but also support, veterans and other members of the military community in the workplace. “I thank Comcast for being a national champion for supporting veterans, not just locally here in Snohomish County, not just statewide, but for hiring veterans throughout our nation. It’s rare for me to see a company – as distinguished from a government agency – so committed to make veterans such a priority, said Erin Monroe, CEO, Workforce Snohomish. She and other Workforce representatives were at the Lynnwood Center of Excellence to honor the call center for hiring 12 veterans this year, among 71 hired throughout Washington this year. “Comcast epitomizes what “Hire A Vet” really stands for. They’ve created a welcoming culture for veterans. They’ve created a variety of affinity groups to assist veterans. They create a family atmosphere for veterans, and not just veterans, for their spouses,” said James Lapsley, veterans employment representative, WorkSource Snohomish County. Among those on hand for the ceremony were members of that affinity group, the VetNet Employee Resource Group. One of the first members of the group was Coast Guard veteran Norman Arnett, of the tier 2 help desk in Lynnwood. “Veterans have a common experience that people who are not veterans just don’t know. Veterans welcome support to succeed. VetNet creates great opportunities to mentor veterans, and it’s just one way Comcast helps its veteran community,” Arnett said. 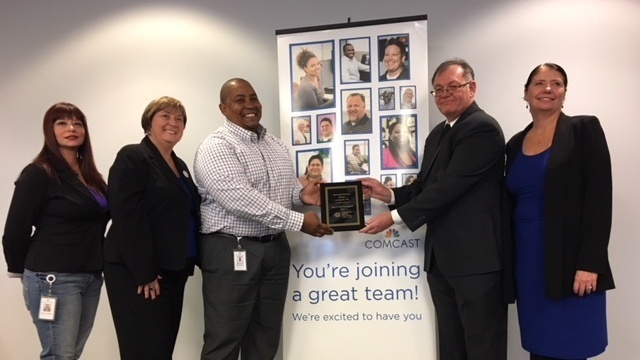 Accepting the award on behalf of the entire Human Resources team were Mark Brown, Comcast’s director of talent acquisition, and Linda Starling, talent acquisition partner, Comcast. Starling accepted a similar award just in October from veterans employment advocates in Pierce County. Once again, that group noted that Comcast has a strong affinity group for members of the military community. You can also read about this award in this story from Lynnwood Today. Photographs: above, left to right, Shae Kingsley, Linda Starling, Mark Brown, James Lapsley and Erin Monroe. Below, speaking after the event, Norman Arnett, Kingsley, Monroe and Lapsley.